Looking with anticipation to creating my image for the Game today and rising early to catch the morning light. It was a bit overcast today, perfect for what had been planned the night before. Soft overcast light with a slight bit of backlight. 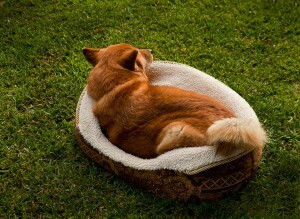 Choosing one of my dogs that has the colors of cinnamon and honey in her coat and placing her in her favorite spot. With a background of the green lawn and the light cream interior of the dog bed created a circle for Kona’s warm colored coat to stand out against, basically the cool colors of the grass receding and the warm colors of her coat proceeding to the viewer. This process of deciding where colors are placed in an image creates color contrast and adds depth in the image. Planning ahead really worked for me this morning. After several minutes of photographing, the sun peaked out from behind the clouds and the light changed dramatically. Preparation was the way to play this one. Doing something that you have never done before can be fun and rewarding. 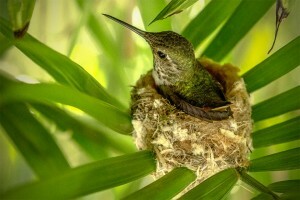 I have photographed birds in the past incidentally capturing their images while photographing scenics. But never where I used a tripod to setup the framing, focus and exposure in advance. Of course Nature photographers do this all the time in anticipation of their subjects entering the image frame. But then I’m a studio adverting guy and this was a fun first for me. The exposure was made while I was at a non-threatening distance away from the camera by remote so as to not disturb the bird’s nesting. When out of the studio where complete control of light is a given, one needs to take advantage of any light source at hand, natural or artificial. This nest is located under a roofed structure and out of the sunlight. The sun did however illuminate the near background, so to help brighten the foreground and balance the color I took advantage of the warm LED mood lights mounted in the patio ceiling. By using what was readily available the scene appears to be naturally lit. This is preferable as apposed to using an on-camera flash that would give it a harsh unrealistic feel. One could successfully argue it is “available light”. 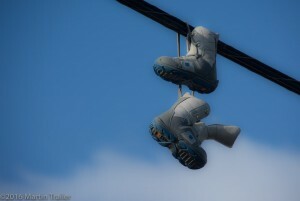 Walking by nearly every day I see shoes on some power lines and the shoes infrequently change. 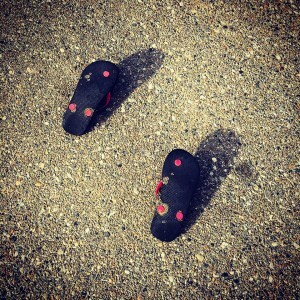 Looking at them I always wonder what the story is behind the abandoned shoes. Are the shoes or boots in this case a prank or were they tossed up there due to vengeful rage of a wipeout on a mountain, payback for the crash? The light was low is in the sky with a slight breeze spinning them just slightly giving numerous angles with the various backgrounds surrounding the power lines. I choose the simple sky with a bit of cloud for some depth. Walkabout: “A short period of wandering bush life engaged in by an Australian aborigine as an occasional interruption of regular work.” I often walk about with a camera, and often that camera is the one in my phone. This particular day I went for an extended stroll on the beach, as the New Moon had created a very low tide revealing a wide, flat expanse of sand. 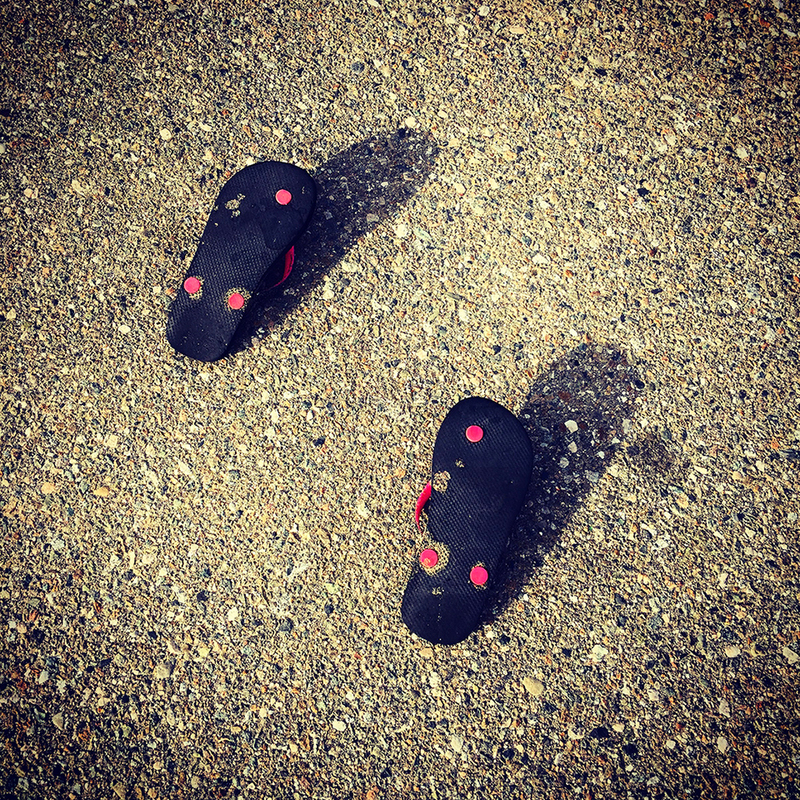 As I crossed the parking lot to return home, I spotted this pair of thongs…or as we called them growing up at the beach, ‘flip flops’. From the size and color I surmise they belonged to a young girl, perhaps ten years of age. Why were they left behind? And why are they upside down? Did she leave them in a rush to get in her parent’s car, or did they fly off as she ran about in play? 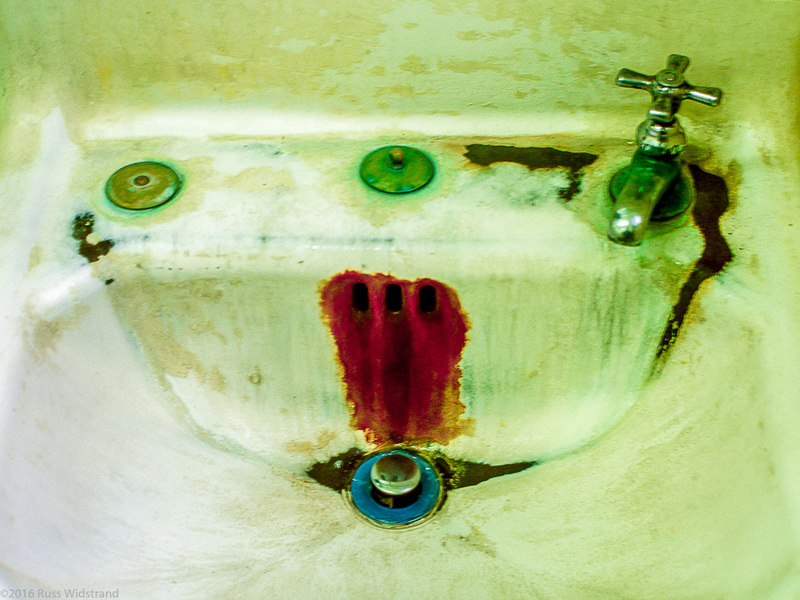 The photography of found objects is one of my favorite uses of our medium. Seemingly ordinary ‘things’ are/were attached to people, and still hold their energy. By the capturing of this image, I will always have a part of that little girl with me. 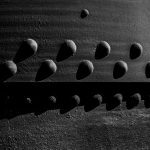 The best way to reveal texture is when light crosses an object. The image can become contrasty in this cross light. Early morning light on a clear sky day will give you a strong, crisp light with hard-edged shadows. It does not matter if your subject is 100 feet tall, or an inch square, the naked sun will rake its light across your object. I enjoy close ups as we see details we probably did not notice before. 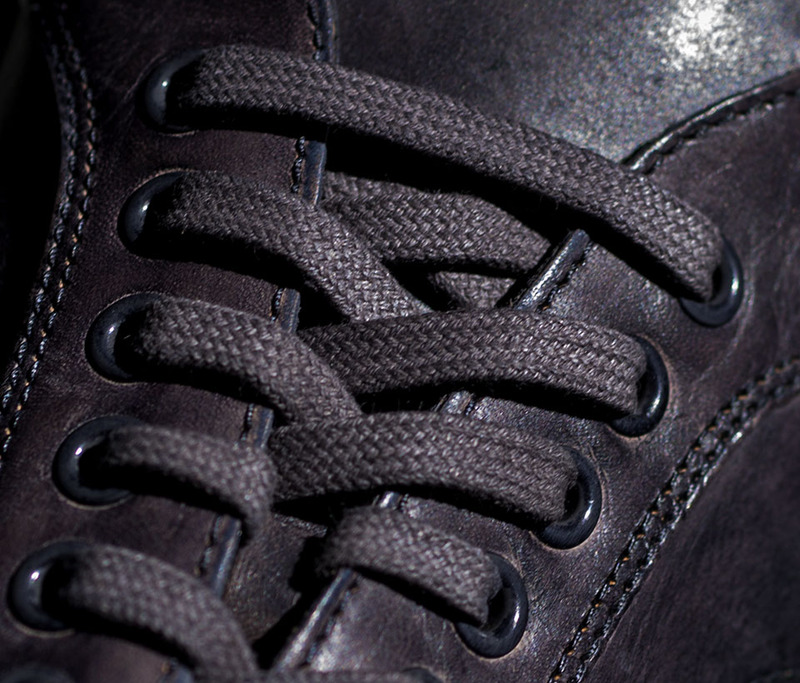 The silver gray leather and shoe laces get their day in the sun. 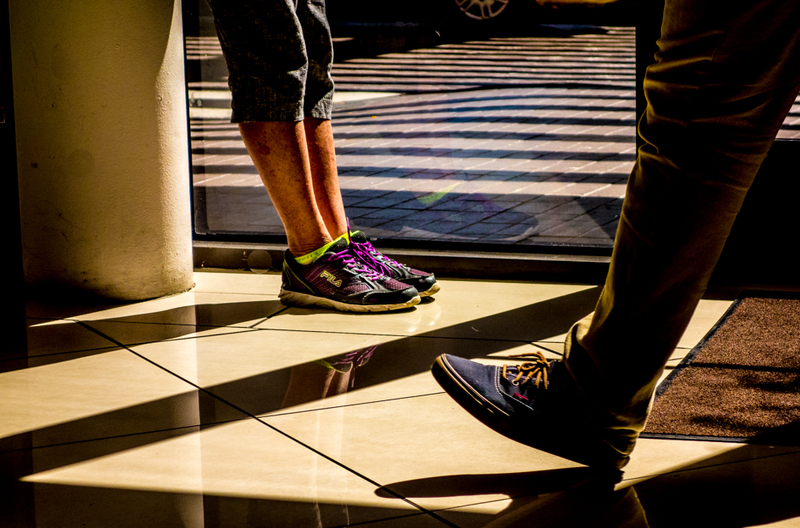 Street photography requires patience, spontaneous action, pre-visualizing, anticipation, and luck. As Jay Maisel said once, “The harder I work the luckier I get.” It is a reference to not depending on luck but sticking to it, and preplanning, and frankly shooting a lot to get that one. Start by finding a graphic background and watch people walk in and out of that area. Anticipating the action with my trigger finger I made exposure after exposure. As “luck” would have it one person came into the scene and just stood there giving me a second set of feet to balance off of with my composition. Since she stood there for some time I was able to have many to choose from. (shooting a lot) Being ready to push the button is key to this type of photography. Having a sense of style and composition is the place to start. That comes with experience. Framing the shot in milliseconds is a must. Trusting your instinct is the rest. 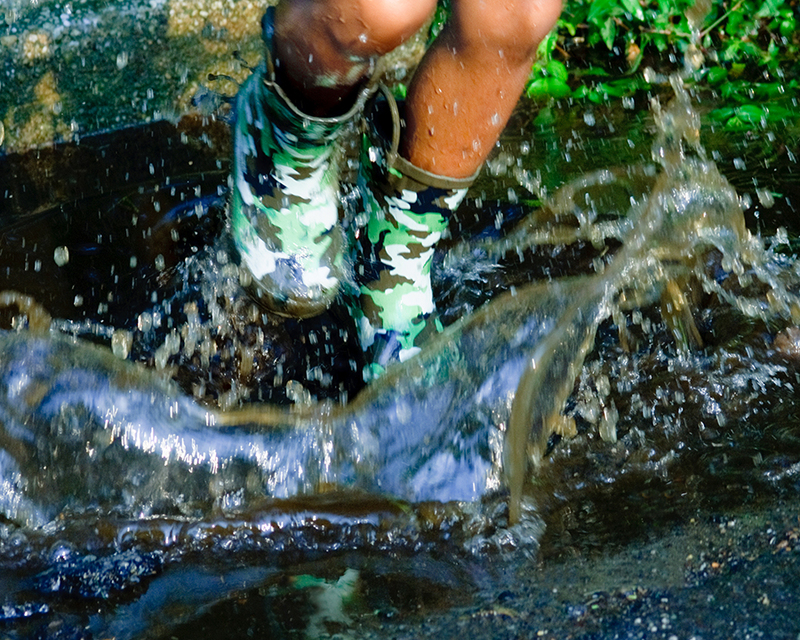 Combine massive puddles, newly paved asphalt, the late summer afternoon light and add a kid who’s been inside far too long waiting for the rain to stop. . My contribution was the angle it was shot at, the lens I used and the boots I made my son wear. 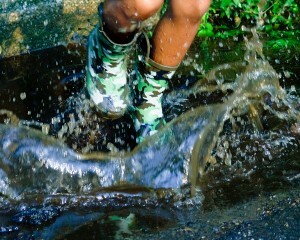 I wanted the viewer to feel the ecstasy of running through the puddle themselves. Earth day is one day, and yet every day is different, except in Arizona. Here we seldom get rain but what a change it makes, even for an hour or two. 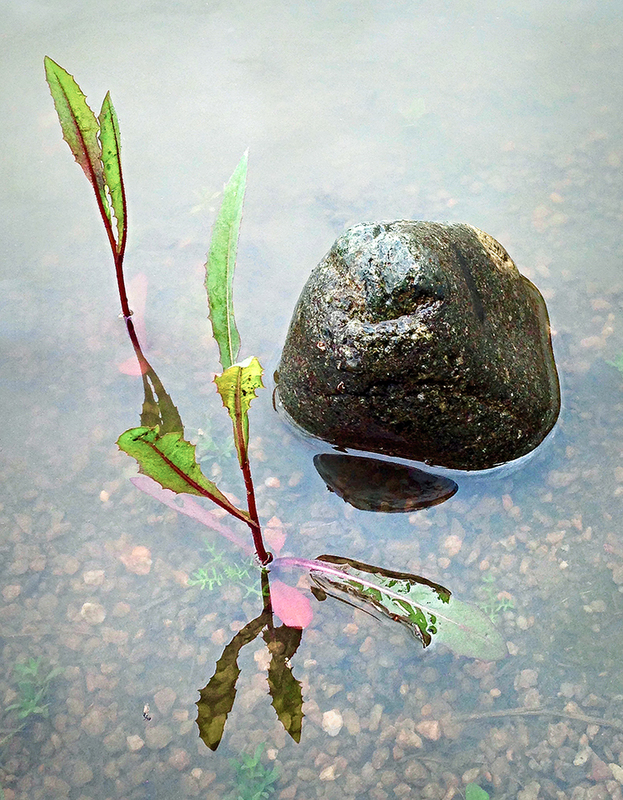 Seeing this puddle with common weeds change in this twenty minute down pour was up lifting. The weeds stood tall and the rock became bolder and yet floated, the backlit grey sky isolated the objects in water for their 15 minutes of fame. Next year we hope to have another good rain and another chance to see a change in our environment. My phone was the capture device so input on this productions was basically composition, saturation, and brightness. My regret is not having a larger camera, tripod, and boots. I confess, the larger file size and flexibility to change f/stop and shutter speed, well they are my “safety net” and or crutches. So, with this rain and the “point n shoot device”, the day turned out to actually be refreshing. The first Earth Day was 46 years ago today, April 22, 1970. I was not quite an adult, but I thought it was a cool idea. The American environmental movement had begun. We had all recently seen the earth in its entirety for the very first time in a photograph taken from the moon by an Apollo astronaut, and that photograph moved mankind collectively into a new consciousness. 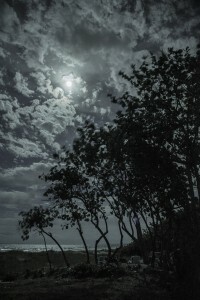 This photograph looks back at the moon illuminating the ocean, the trees, and the clouds in an environment that I personally revere for it’s simple purity. It happens to be on the barrier island that is Cape Canaveral, Florida where mankind’s journey to the moon began. Here my entire awareness is dictated by what’s going on with the sun, the moon, the wind, and the water. When I am here alone where I have lived much of my life going back to childhood, I am in an intimate and all-encompassing relationship with the environment like no place else on the planet. It’s all there is. Back when film was the material used in photography, a picture like this was impossible to achieve, because film didn’t respond and record such low levels of light very well at all. That doesn’t mean I didn’t try to make pictures like this when I was young. I tried. I would get one long time exposure that took most of the evening to make, and the results were nothing like what I saw with my naked eye. 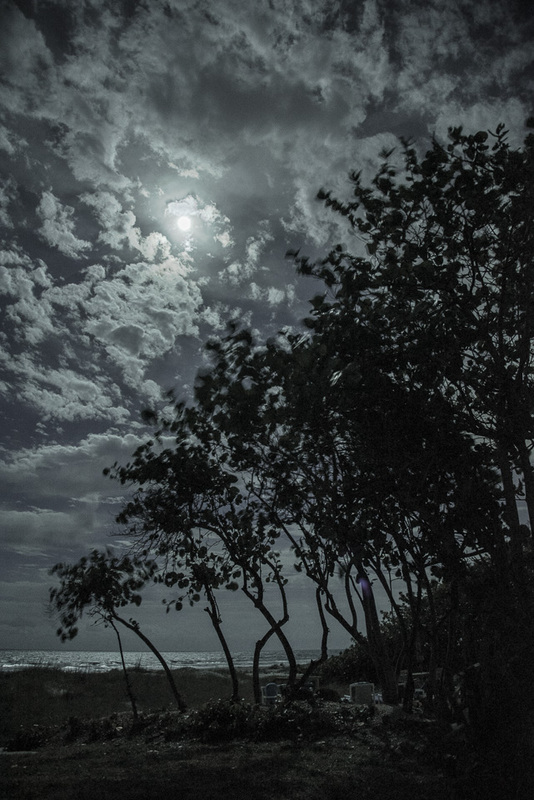 The moon would be too bright and blurred from the long time that the shutter was open, and the water, trees, and clouds would be so dark that the image was always a failure. Now with my excellent digital camera, which has much higher sensitivity to small amounts of light, I am able to make a dozen reasonably successful exposures in just a few minutes. This photograph captures what I was experiencing in this gorgeous earthly place. Creative leaps are risky, as they should be. This image is a leap from the safety of the expected to the unexpected. The attempt is intended not to confuse, but to compliment the conversation with surprise. The two images have no points of visual reference beyond the fact that they share connecting material in the physical world. 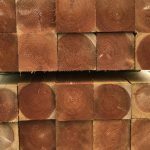 Still, there is a knowing familiarity that unites these images, and might even bring a smile to a face, it just happens with your mind and not your eyes.